Club Ties Maccravats, the first company in our small group was established in 1937 in Macclesfield when the town was the centre of the country´s Silk Industry. 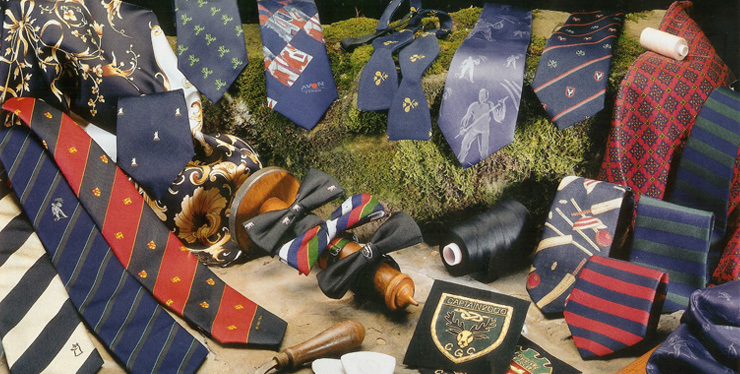 For more than 70 years we have been making club ties, company ties and scarves in traditional silk and more recently in polyester. The quality of the woven fabrics we use and the methods of tie manufacture have improved dramatically in recent years, enabling us to make top quality woven club ties at competitive prices. Unlike many, our club ties and scarves are manufactured in our own factory, in Macclesfield. This enables us to control quality and accept very short delivery schedules, if necessary. On our products page, you will see examples of various club and company tie styles as well as our other products such as Presentation Table Cloths and Blazer Badges. If you need ANY HELP to decide on the layout for your tie, please email us or telephone for a chat about it. Our minimum order is 50 ties, but different ground colours can be supplied within this quantity. Need more information on our products and services? Why not let us call you back? Just complete the form below and our we will call you. Tell us a little about your project, requirements and/or how we may help you..